This is plate 35 from Robert Melville Grindlay's 'Scenery, Costumes and Architecture chiefly on the Western Side of India'. Grindlay (1786-1877) was only 17 when he arrived in India in 1803. He served with the Bombay Native Infantry from 1804 to 1820 and during this period made a large collection of sketches and drawings. Situated fifty miles south of Jaipur in Rajasthan is the ancient town of Tonk. 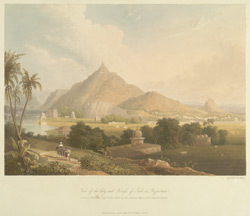 Grindlay wrote: "Although from the sandy unproductive soil of this part of the country there is but little foliage and cultivation, the varied outline of the numerous hills, most of which are crammed by forts or temples, gives a picturesque effect, greatly increased by the appearance and costumes of the inhabitants."